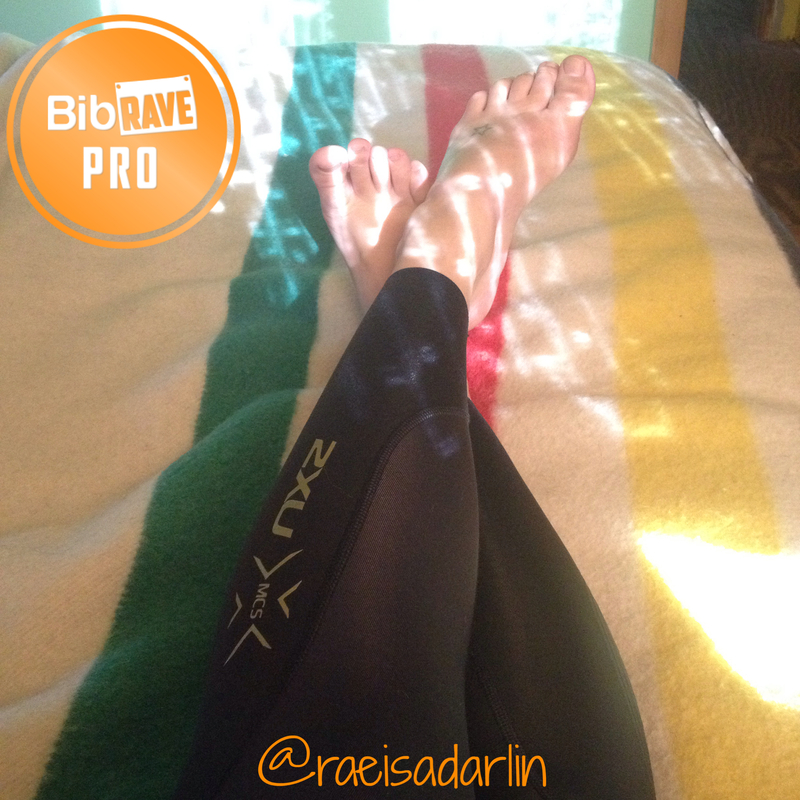 Disclaimer: I received a pair of 2xu MCS Elite Compression Tights to review as part of being a BibRave Pro. Learn more about becoming a BibRave Pro (ambassador), and check out BibRave.com to review find and write race reviews! I don’t have a lot of compression gear, but what I have, I love. It’s been very good to me in the year and change since I really got serious about running. Now that I’m about to embark on training for my first full marathon, taking my recovery seriously will be more important than ever. When I got the chance to try out these 2xu tights through BibRave, I was really excited. I’ve only ever had compression socks or calf sleeves before, and I was curious to see if tights could really help my legs recover better, the same way socks and sleeves have helped my calves, ankles, and feet. At first glance, the tights looked tiny and flimsy. I was worried that they’d be totally see-through, if I was actually able to get them on at all, but I needn’t have worried. These tights were easier to get on than some compression socks I’ve tried, and I didn’t notice that they were letting anything show that shouldn’t be showing. I could actually see the Muscle Containment Stamping (MCS) in the fiber, which was pretty cool. Sadly, my experience with these tights was less than ideal. I ordered the correct size for my measurements, and while the fit on my legs was absolutely perfect, the waistband cut painfully into my stomach. Even if I pulled them up as high as I could, they still gave me major muffin top, and the fit was so tight around my stomach that I couldn’t wear them for more than an hour or two before feeling sick. I know I carry all of my extra weight around my middle, but it seems to me that this problem could be mitigated by using a wider waistband. The narrow elastic is very unforgiving. Despite the poor fit in the waist, I really do feel that the compression benefited my recovery. The first time I slipped these babies on was after my first Spartan Race back in September. As you may recall, I basically ran up and down a mountain, in addition to completing the obstacles, and by the end of the day, my legs were wrecked. I put these tights on as soon as I got home and left them on for a few hours. With them on, my legs felt supported and fresh, and a lot less awful. And my legs weren’t as sore the next day as I would have expected. I also wore these after a 10 mile training run, and got the same sense of support and re-invigoration that I got after the Spartan race. I’d be curious about trying a larger size to see if that helps the fit problem, but I’d also be concerned that I would get less compression, which would negate the benefits. I also know that other Pros who tried these tights loved them and thought they fit perfectly, so I may truly just need a different size. Have you tried 2xu products? What did you think? I find buying stuff online tricky because what is supposed to fit you doesn’t always fit you. I saw your pic on IG today and wondered how you like them. 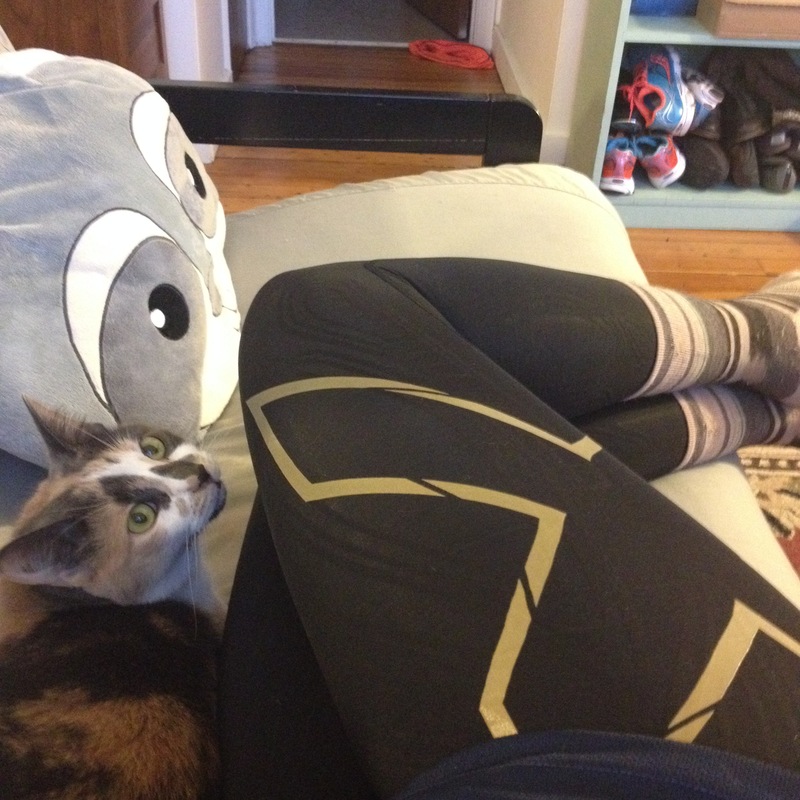 I’ve been toying with the idea of getting a pair of compression pants but haven’t found ones I’m in love with (yet). I love everything about these except the waistband, which is a huge bummer. I have a pair of the compression sleeves. They are ok compared to others, but I prefer CEP brand. I haven’t tried CEP before, but I’ve heard good things. They are as close to medical grade sleeves that you can buy. I use them for any runs over 10 miles, and my legs thank me, lol!! I still need to try compression pants. I keep hearing about them but never tried them. Bummed to hear the 2XU brand was less than ideal – I like their stuff for tris. I think CEP makes them, and I love my CEP socks so might be worth checking them out! Been hearing great things about CEP! I used to swear by compression pants. These might convince me to live in them again! I had the same problem at first and hated them initially, but I pulled out the drawstring and then really STRETCHED the waistband…and STRETCHED IT MORE! Honestly, almost to the point of ripping them, but now I can actually wear them comfortably and love them! I actually talked to a 2XU rep who said they’ve gotten a lot of feedback saying the same thing and that there’s a good chance they’ll have a wider waistband in the future! That’s awesome! I hate the drawstring anyway and will definitely try stretching them out, cause I love how they make my legs feel. Interesting. Glad I read this. That waistband sounds painful. A lot of clients are looking for good recovery compression and I love the idea of this. I love the idea too. One of my fellow Pros was able to stretch out the waistband enough to get comfortable, so I’m gonna give it a try.